Hold and transport a variety of your most popular baked goods with the Regency 20" x 26" x 69" end load bun pan rack! This bun pan rack can hold up to 20 full size sheet pans or 40 half size sheet pans - up to 350 lb. of total weight - with 3" of space between them, ensuring your foods can be stored safely. The whole rack ships unassembled so you save on shipping costs, and it's mounted on four 5" hard plastic casters (two with locks). we use these to store some items, i only rate it as a 4 because out of the 8/9 i ordered, two didn't hold up. i didn't set em up until after 3 months of purchasing em so i understand that they wouldn't honor it. but at the same time, i had spent thousands on this site already. i still will order product from here, just thought they'd take care of a loyal customer like myself. Love this pan rack. It makes our kitchen much more user friendly to be able to load it from one side and then load into the oven from the other. We have this set up in our farmhouse kitchen for baking for farmer's markets. It's sturdy, but lightweight and easy to move around as needed. The narrow width allows it to fit into our kitchen without taking up a ton of precious space. i don't know how we would live without it! The rack was very easy to assemble. Lightweight construction but feels sturdy and holds weight very well. It rolls and maneuvers quite smoothly when fully loaded. Very pleased with it. Have had this rack for a while now and has held up very well. No problems using it in our bakery. We have ordered a few of them. Great bakers rack! This is actually the second one that I have ordered. It comes unassembled but it is super easy to put together. It holds up to 20 full size sheet pans which is perfect for the amount of cupcakes we bake! easy assembly, rolls great into the fridge and all around the kitchen for multiple uses. purchase the cove and it can be used as a proofer in a bind. I own two of these and the are great! Easy to assemble and hold up well! They also don’t take up much space at all. Horribly unsturdy. Wobbles from side to side constantly and even with no pans on it, I'm worried it'll fall over. Waste of money for sure. Very easy to put together! Very sturdy but light enough to move around. the only kind of annoyance is I wish the holders were a little closer together. I bought full and half sheet pans for the rack and they fit, but if someone puts them on the rack too close to one side, the tray could possibly fall through if the item is heavy enough. Just make sure you place the pan in the middle. Not too impressed with this rack. Gets the job done, but is extremely flimsy, tilts on a slant and is hard to move. I tightened the bolts as tight as I could, made sure everything was correctly in place, and still cannot get it to stop tilting to the side. We’re sorry this product did not meet your expectations, Nick. If you ever have any questions about the product you purchased, please chat into our Customer Solutions team! We’re sorry this product did not meet your expectations. Our friendly Customer Solutions Representatives are always available to assist you with any questions or issues before or after your purchase! Very sturdy and reliable. Strong steel. We use one rack for room tempature storage and the other for cold storage in our walk in fridge unit. We purchased for entirely different usage. We put pans of eggrolls on the rack and moved them into a freezer. held up darn good considering the environment. was the cheapest way to go until we got a freezer tunnel. would believe they would be a 5 star for bakery usage..
We use this baking rack daily in our small baking business and it’s never let us down! We can happily report that our rack just turned 6 and it looks and works like the day we bought it! Buyers worried about longevity should buy without hesitation. Great Price on these speed racks. They are very sturdy and the wheels are high quality! I always need racks I got a couple for our bread kneads! I have 2 of these and they work very well. They are very sturdy and hold up well. We use them daily in our store. regency baking rack holds up great for the price. it was very inexpensive, the quality of regency it not bad. i am going to buy more. The rack worked out great for our event at a festival. It is just as sturdy as our current one. Just remember to tighten all washers and bolts with wrench. it loosened when I tightened it with my hands. We love it and also bought the cover for outdoor use. No difficult to assemble. Really pleased with the quality. Rolls really well. It is large. I use this in my home for when I cook for Thanksgiving, etc. to have a place to store cookies and rolls while they are cooling. Love it!!! Would buy this brand again. There was a cylinder that didn't have threads in it, so I had to find a tap to fix it. Not a great quality, but luckily we don't have to move it around a lot. This is a must for both on and off premise catering. Speed racks are essential for storage, transportation, ease of execution. It was easy to assemble, which was key! Really great and easy to assemble. They come with clear instructions on how to put them together. They work really well in a bakery or high volume restaurant setting. Perfect storage cart for makes sugar cookies. I don't ave enough counter space so this is perfect for keeping them all in order and out of the way. These racks are not only affordable, but more importantly, they really stand to use and misuse. I keep buying them as we grow. Great purchase. These racks are perfect. I brought this and it hold a lot of pans when needing to cool cupcakes and cookies. You can skip a tray when you need to cool your cakes as they need more space in between to cool quicker. I ordered two, one came bent but it was still usable. Not the best quality but will do for the price. These are great to have around when doing a lot of prep for storage. Thank you for your review, Suzana! We are sorry this Regency 20 Pan End Load Bun / Sheet Pan Rack - Unassembled has not worked well for you. A Customer Solutions Representative will contact you soon! Great rack for a lot of different uses. We use for the cooling of fries, wings, and other cooked items. Easy to clean as well. These Bun pans are sturdy and easy to assemble. The wheels rolls smooth and swivel without that awkward lock up some of the other brands have. Regency 20 pans tray rack. my second time to purchase this item. very good quality roll fast and easy to move. I used this in my bakery shop. These rolling racks are exactly what we were looking for we ended up ordering another after just a month. Its very durable and holds a lot o weight. Its also very easy to clean and roll around the bakery. The Regency 20 Pan End Load Bun / Sheet Pan Rack arrived quickly and was easy to assemble. So far, I'm very pleased with this purchase. The rack was easy to assemble and does it's job. The only problem we are having is the screws seem to loosen a little and we have to tighten those about once a month. For the Value the rack gets 4/5 from us. We should have gotten this sooner — it helps us free up so much counter space. Will definitely purchase again. It is very sturdy and you can’t beat the price. This sheet pan rack works great for us. It is the perfect size. We use it as a cooling rack for our confectionary business. Easy to assemble. This is such a good and sturdy product. We have three of these in our storefront. They are super easy to set up, to clean, and are fully functional. Love them! Surprisingly sturdy and smooth, given that it is far cheaper than the competition. We've used it for over 2 years, even moving it to different sites a few times and we haven't so much as had to re-tighten a bolt. The brakes engage and disengage quickly, and keep the rack right in place. We have put ours through a lot, it consistently has over 350 pounds of soap on it and it is still sturdy and steady. Assembly was so easy I honestly don't even remember doing it. Sturdy, sturdy and sturdy! This Regency 20 Pan Sheet Rack has a 350 pound capacity. We accidentally tested this out once by loading 475 pounds of pumpkins on sheet trays and on to one rack. We then wheeled it across our kitchen facility (60 foot span) and it moved without an issue! The polyurethane swivel casters are heavy duty, the real thing! We were all mind blown. Don't spend more money anywhere else on a similar product! We absolute love this sheet pan rack! We fill a pan with our products and then load the pan onto the rack. The rack allows an individual to pull the pan out smoothly to grab a product off the pan. The rack goes right in between our shipping stations, which then allows a person to pull a rack from either side. Super convenient and incredibly durable. We purchased this rack because we needed something durable and sturdy for our day to day operations. It has been perfect to hold our trays of fresh dough and has held up now for over 3 years. This is a great value. It is not assembled, so be prepared to build it. That, though, saves you a lot of money on the price and the shipping, so it is worth it. Works well for what it is. We load this probably beyond its capacity and it tends to wobble a bit, but other than that it has held up well in 3+ years. Very easy assembly. So easy to assemble, definitely order it not assembled to save your self some money. Sturdy and easy to maneauver. Fits into our walk in cooler no problem. Sturdy cart that fits up to 20 pans. Rolls smoothly without squeaking. The only time it disappoints is when it’s full of dirty, sticky sheet pans. I am SO VERY happy with this Bun Pan Rack! It is just what i needed in my HS culinary classroom! Now I won't have to have our counters cluttered with sheet pans while items are cooling or drying! The quality is awesome and the price can't be beat! SO HAPPY!!!! This sheet pan rack comes with nice wheels. 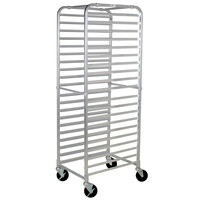 The cart can easily be moved and sheet pans fit nicely on the rack as well as easy to move in and out. Overall this gets the job done, but it is not always the most stable or sturdy rack. We get a little nervous if we overload it, so just use with care and caution. I was very impressed with quality of this rack for the price. The instructions were clear and easy follow, so I was able to assemble it quickly and easily by myself within 15 minutes. Though it stays stationary most of the time, when we do need to move it, it maneuvers well and feels very sturdy. At this price I expected it to be flimsy, so it was a rather pleasant surprise and I expect that this rack will last us for years. It is an excellent fit for our rather tight kitchen, and a product I am confident in recommending. These racks work great, they are simple to put together and they hold all 20 pans with no issues. We use them constantly and we put some heavy stuff on them and have not had any issues. We love using this sheet pan rack in the miFLAVOUR kitchen! It helps make moving sheets of product around the kitchen a breeze! Nice and sturdy! Definitely recommend. It was really easy to assemble and shipped well. Once completely assembled, the functionality of it is good. The wheels roll well and even fully loaded it is easy to move the rack around. The bun rack makes life in the bakery easier! This one is a good quality and does the job well. We use it to store product on full size sheets and purchased the protective cover as well. We use this daily at my restaurant for a litany of prep tasks and it has never let us down. Sturdy, easy to install, easy to clean. The rack is great for the price. The sheet pans fit nicely. Slide out is only hindered if casters not locked. Good quality product comparatively. i was a little scared to purchase this pan rack unassembled, but it was so much cheaper that I gave it a try. super easy to assemble, strudy and easy to clean. Excellent solution for those with limited space options. I use this constantly as a mobile countertop in my kitchen - everything from staging ingredients, cooling items, packaging items, to a giant draining rack for cleanup. I find this invaluable in the kitchen, and cannot wait to make room for another. With enough room for 20 sheet pans, this cooling rack provides plenty of space for cooling our product. The wheels make it easy to move the cooling rack to the oven, making it so we don't have to walk too far with hot product. The pan rack was flat packed so it was easy to get into our cafe. Assembling it took about 15 minutes. It fits all our standardized pans and rolls smoothly. Good price for what it is. Thank you for your review, Neil! We are sorry this Regency 20 Pan End Load Bun / Sheet Pan Rack - Unassembled has not worked well for you. A Customer Solutions Representative will contact you soon! This rack has held up nicely over time in the kitchen. A super useful rack that does not take up too much space and is easy to move around. Overall, this is a cost-effective speed rack, but I have had problems with the ones we've purchased - the slides eventually break off, one by one. It happens over a period of months/years, so it's not a huge issue right away, but is still significant. We had a friend who is a professional welder re-attach them, and he noticed that some of the aluminum welds that hold the slides in place are cracked - he reinforced them, but noted that that was what was making them fall off. It's worth noting that he was doing our welding work for free, so had no motivation to mislead us about this flaw. LOVE this product. I was thinking about doing a smaller one but I am so glad that I did the bigger one. It is strong enough to handle all of my baked goods and ever some supplies that are in my way. Very happy with this product! Item was exactly what we were looking for! Website described it exactly and it has met all of our needs. I would recommend this to any busy kitchen! I use this for storage for my bun pans, bowls, cutting boards, and utensils since my restaurant is very limited on space! All of them fit perfectly and there is not catching when you slide the pans in and out of the racks. This is a great value rolling rack. I've seen them at my local restaurant store for up to 4 times more expensive. It was easy to assemble, probably took me less than 20 minutes. Just all around great product for the price and I will make great use of it keeping my full pans or half pans in the freezer. This has been a great value rack and I wouldn't hesitate to order another. The casters glide much better than I expected and assembly was extremely easy as well. We have ordered this product multiple times. Have found it so useful for proofing bread and general storage, as well as, for event execution. You can never have too many racks! This bakers rack has been a game changer for me and all the cookies that I bake and decorate! It keeps all the sheet pans evenly distributed for air flow and minimizes the footprints I would normally have with trays all over the place! Great investment and super easy to assemble! Very sturdy and rolls easily. Hold all of our baked goods without any issues. Holds 20 full size pans. Pans slide easily and don’t get jammed. We bought these to store sheets of media as we cut them and it does the job! They came well packaged and were easy enough to put together. Assembly was easy. The rack isn't the sturdiest but when it has enough items on it to weigh it down it's nice and stable. A good value item. This is a very sturdy and high quality sheet pan rack. We use it to store our sheet pans when taking them out the oven. There is quite a bit of space in between each pan which is great for cooling. We make and sell fruit bouquets. We need to dry the fruit before dipping in chocolate. This rack is the perfect solution to keep fruit separated and ready to dip in chocolate. Casters roll so nicely. Light, yet sturdy. We bought two and they fit our sheet pans perfectly. No assembly directions, but he pictures on the website are clear and very useful. I tried to post a video, but it didn't went through, but it's easy to assemble and very sturdy, but some of the hardware pieces was missing but they quickly responded and sent it!!!! Not the best quality but for the price it does the job. Its a little flimsy and the sheet trays don't fit too good on the shelves. Great quality rack for a great price. We put it together fairly quickly too! Just make sure you assemble everything tightly so the rack is even. The light design makes this easy to use handiwork with. The quality of aluminum is fantastic and we love using this. It arrived quickly and was easy to build. Love this rack, it worth the money, the wheels are excellet quality and you can fit perfectly 20 full size pans on it, I strongly recommend this rack! Price is great, but a bit of a pain to assemble - no instructions... On the lightweight side - fine for a lot of uses, but heavy pans will bend the supports. I use this for candlemaking, and it does the job. The construction is light aluminum, which can make it feel a bit unsteady at times, and the edges on welded parts can be sharp at some points. You can lock the casters, which makes it feel a bit more steady. Overall, I would buy again. We have four of these speed racks. They are super easy to assemble and we haven't had any issues with them. The pans slide on and off easily. Great quality product for the price. I would absolutely re order if and when these need to be replaced. I really Loved the see through option. We ordered this rack due to lack of space for storing our large sheet pans. It is wonderful, very sturdy and easy to move. It also holds the half sheet pans when turned sideways which was a surprise. This rack definitely does what we need it to and frees up precious counter space once the pans are loaded. Poor quality product. They are assembled with cheap plastic parts that don't last long. I purchased 20 and have had three break within two months. This rack is perfect for the storage of multiple racks and frees up space in the work place. This rack is able to withstand temperature changes, we store this rack in our freezer and it gives us more space to work in. If I could give this more than five stars, I would. The price is phenomenal, and it works great. We are just a small coffee house, but we do a lot of baked goods throughout the day, and this is an amazing way to allow our dough to rise, store hot baked goods, etc. The regency 20 pan end load bun sheet pan rack is one of the best purchase i could have ever made. Granted it comes unassembled but its not hard to build and the price can't be beat. For your money, this is the best cheap sheet pan rack on the market. It's definitely not the sturdiest thing ever made, but it's held up pretty well in our high volume kitchen. Kind of a pain to put together though. Easy to assemble, holds tons of product, durable and isn’t wobbly like most of those speed racks you buy for this kind of price. Great product for the price. These last about two months in our bakery, extremely light duty for light use. The price is tempting but it take 6 of them to get the life of a solid welding rack. Thank you for your feedback! Please contact our Customer Solutions team as soon as possible if you are having issues with an item you ordered from our site. This rack arrived with substantial shipping damage and had to be replaced. Could use stronger packaging. The rack itself is very lightweight and easy for one person to maneuver in light-duty applications. I would be hesitant to load it with lots of heavy trays. Holds our pans as well as can be expected. Sturdy and affordable, this bad boy is ready to serve us for years to come. Recommended! A great value and well constructed sheet pan rack. This unit is great for cooking multiple pans of cookies without taking up a lot of space. Very happy with this pan rack so far. My husband put it together rather quickly, it is sturdy and moves around easily. I expect to get a lot of great use from it. Perfect rack for our tiny bakery kitchen. Stable, sturdy & holds pans out of the oven or freezer. I can wheel it wherever I need it and store it in a tiny space near the freezer when I leave at night. Highly recommend! This is a great pan rack for the price. The only thing is when it first arrived one of the cross bars was unthreaded, so I couldn't finish assembly until webstaurant replaced the piece. Nonetheless, it is completed and working great now. This is our first Rack and we LOVE it! It has made organization and extra storage for our baked goods simple and easy. With the cover, the confidence of whatever we place on the baked sheets will stay fresh for the day without worry of anything flying in the air and getting on the product. This cart does exactly what I need it to do. We use it to store apples. We have not had any issues with this cart. I love the fact that I have many of choices for heights when it comes to storing items on this cart. I have lots of these carts in my kitchen! A little difficult to put together, but is great in our kitchen. So nice not to have pans all over the kitchen counters!! Glad we bought it! The rack is not very strong and a little wobbly. It serves its purpose and has a lot of space for both half sheet pans and full. This rack is perfect for baking. It's easily assembled, really sturdy and the front-load version is a space-saver! I've had mine for a couple years and it is still looking great. This rack arrived on time. Standard 3 day shipping. We are very happy with the product. It was very easy to put together. Took me about 10 minutes. No tools required i came with a tightening tool. Not completely in awww with this product, but it does serve it's purpose. Easily holds 20 full sheet pans or 40 half sheet pans. Could be a little sturdier, but over all its a good rack to invest in for starters. Good duty rolling rack. Seems to be sturdy so fa. We liked it because of the value it had. Looking to dee the durability of it. Such a great buy!! This is the best price we could find for the double tall rack, and what an improvement from the single!! This rack is easy to put together and is very durable and sturdy! Love it!! This is an excellent value priced speed rack. It was easy to assembly, and has nice sturdy wheels, that still roll around after six months in the restaurant. Also holds 18x20 cutting boards. I would purchase this again. Awesome! Super simple to assemble and put to use. We use these daily for racking breads, cinnamon rolls and cookies. We purchase many of these. The rack appears to be very sturdy when assembled. The assembly instruction is not included, but the video on the website is very easy to follow and the whole process of putting together takes less than 10 minutes. The casters roll nice and smooth. I have taken away one star because one of the rails had incomplete polishing where little piece of metal sticks up along the rail and may end up scratching the pan while sliding the pans in and out. This is a great bun rack! Easy to assemble and light-weight. Fits the baking sheets that we use perfectly. And, as always, Webstaurant has great prices and fast shipping! This is a good quality sheet pan rack for smaller kitchens that need movable storage space. It can carry a good amount of weight and is easy to move around. I am super impressed with the integrity of this speed rack for the inexpensive price I paid. I will be purchasing more of these bad boys! This cooling rack is one of the most used items in our kitchen, and we love it! It's perfect size to store and cool multiple things at once. This was exactly what i needed. Its a med duty unit. priced accordingly and its held up up for quite a while. Good purchase i recommend. This is a good product and easy to install. It was shipped in good condition. The only flaw is, there was no instructions on how to put it together so I had to use common since. Now that it's together it's useful part of my kitchen. This is a nice, lightweight sheet pan rack. It came unassembled, but was pretty quick and easy to assemble. The casters and wheel locks work well. This is a sturdy cart and adds extra storage to my cramped kitchen space. We use several of the racks to store small dishes in easy reach. The wheels work smoothly and lock up tight for safety. Assembly was so easy. Great rack. Very sturdy and rolls easily even when completely full of product. This is by far one of the better racks that we have purchased. This rack is great, it sure saves me space with the use of vertical space coupled with the cover. Very nice, sturdy, well made, rolls good. For such a low price, I was not expecting this rack to be as sturdy and as easy to roll around as it is — it's FANTASTIC — and I am certain to buy more as my fledgling artisanal bakery operation evolves in the coming months. Don't be put off by having to assemble this rack — I began assembling it just after putting four trays of croissants into the ovens, and my new rack was ready to receive the croissants when they came out of the oven 30 minutes later! The unassembled rack arrives in a box that contains the two rack sides, the four wheels, and six cross-supporting metal dowels that are easily finger-tightened into place at the bottom/middle/top of the rack with the included 12 bolts, then further tightened with pliers or a wrench. This is a terrific, economical buy for an indispensable product. Two spatulas way up for this item! Such an amazing product! It was super easy to put together and with having a food trailer my space is very limited so having this rack to be able to store my product has freed up so much space! I would definitely recommend this product! So happy we purchased one of these. Really easy to put together and so much more space for a small and growing bakery. Remember to pick up some sheet pans. We have about 8 of these racks and love how lightweight but sturdy they are. They aren't always exactly level but it's somewhat easily fixed with playing around with the wheels. Great product! I actually need to order more. So I am glad this showed up on here to leave a review. I use it all the time! Great sheet pan rack for a very affordable price! Comes unassembled, but assembly is very easy, and worth the savings of purchasing an unassembled version. Sturdy, and easily wheels around, so you can transport the pans with ease! The cover was perfect. It fit very well and I love the ease that the 3 zippers provide. It was perfectly long enough for the rack. I love this product. We have four of them in our shop and use them constantly. It is a great space saver. This was a great price for the quality. Box was damaged when delivered, but rack inside was unharmed. The rack seems sturdy enough but does have some rough edges. All in all a good product so far! easy to assemble. Easy to use and store bun pans. I will have to get the covers for these. This rack is durable and makes like easy for me. I use it for a cooling rack with the breads and cakes i make. This sheet pan rack was very easy to assemble and comes in handy 100% of the time. It's easy to move and stores our pans easily with no problems. I bought three of these and I am happy with all of them. Easy to assemble. Sturdy and reliable. If I had room I would buy three more. this sheet pan holder was a solid choice. Easy to put this together. The unit is sturdy and has held up just fine in our busy kitchen. This is our second rack that we have purchased for our bakery. Easy assembly and great to have to organize all our products before they go out to the display case. You can not beat that price. Easy to assemble. We could not function without these racks. If you take care of them they will last a long time. I purchased this Sheet Pan Rack for my small bakery. I bake cookies and cakes and this is absolutely ideal! It was quick to assemble, it is very stable and well worth the cost. I love the smoothness of the wheels - it glides so nicely across the floor! I am 100% satisfied with this product! Came in pieces for easy delivery and was simple to assemble. We use this in our walk in cooler. Works just fine. Have had a similar one for 2 years. Easy to install ( less than 15 mins for installation) great quality for the price. I would recomend this product. Looks great in my kitchen! This is a very simply yet effective sheet rack, very easy to put together. After assembly it's a very ease of use item that holds plenty of either 1/2 trays or full trays. I ordered this rack and received it very promptly. At the price I didn't expect the quality I got which is nothing short of amazing. Assembly was a breeze after watching the very informative video which gave important tips on the sequence of assembly. I have a very small concession stand and this rack gets moved a lot and used a lot. I've never had to go back and retighten anything, it works just as advertised. If you run a bakery or want to keep drafts and dust away from your product, buy the zipped cover offered. I am so impressed with Webstaurant store that I have recommended them over and over to other small businesses. You certainly won our business now and in the future. what a great speed rack. this rack come disassembled it works so great because of the amazing price. it works just as good as all the more expensive speed racks don't waste your money buy this one. Received the bun rack in a timely manner. The rack is built well and very durable. Good value for the price. Only change I would make is to include assembly instructions with package. I first purchased this rack for use in my home baking business and then moved it to my shop when I opened up a retail bakery. It's great for saving space, I use mine with a rack cover to store and then pull single layer cakes as they are needed. My only complaint is that the runners which support the trays needed a little oil so that the pans would slide easily in and out. Otherwise, it's sturdy, easy to clean, and highly useful. For the price this rack is great . I think webstaurant really helps small businesses start out by offering products like these that are NSF and very affordable ! I was concerned when I opened the box and found no instructions. However till I located it on this website and opened the video to watch, my helper had already figured it out. Very easy to set up and very sturdy construction. I'm very happy with this purchase! Perfect for the price. So easy to set up. Took maybe ten minutes. There was no instructions included which is a little annoying. But since they were so easy to put together it wasnt a huge issue. The carts are a wonderful solution to many storage needs, like my heavy duty immersion blender, curing my soaps in a protected area, and storing completed products for safe keeping! Great product! We use it in our bakery everyday. Very sturdy and reliable, as we have been using it for 2 yrs now. Highly Recommended!! I wouldn't necessarily call this a "quality" product. It certainly does it's job, however the aluminum that it's made out of is a lower quality than what I would expect, and I don't necessarily trust that it would hold a full load of weight before bending/collapse. Just keep this in mind when you purchase it. Thanks for the review, Sean! We're sorry this economical option didn't suit you. For a heavier, stainless steel model, try this Regency 20 Pan End Load Stainless Steel Bun / Sheet Pan Rack - Unassembled. This sheet pan rack has been sturdy and reliable for us. It was very easy to set up and is very easy to move. I don't see how you can beat it at this price. These are a great price and we have found multiple uses for them, including storing cutting boards (the large size fits perfectly). It was easy to assemble and rolls nicely. I am a home baker and sell at Farmer's Markets and this rack is perfect to make the most of my kitchen space. My grandson and I put it together in about 10 minutes. The quality is better than I expected and the delivery was very quick! We purchased 17 of these racks to use to store small parts. Within six months half of them are falling apart. The price is nice and they are easy to assemble but you get what you pay for so buyer beware. The company was nice enough to credit use for three of them because the warranty is for three months and that is about how long they lasted before failing. The rack that holds the trays are falling off. We appreciate your review, Cary! If you are looking for a product that better suits your application, please contact our Customer Solutions team. This rack was so simple to set up. And once it is, it's as sturdy as a rack that costs twice as much! The castors are smooth and the locking ones keep it right where you want it. I was a bit concerned about whether it would be as sturdy as if it had come assembled already. However, the lower shipping cost swayed me and with the easy to follow video instructions, I decided on the unassembled rack. I'm extremely happy with my choice. Once built the rack is great. The material is sturdy enough and will do the job with ease, especially with these wheels. It also has a nice look to it both in color and with the rounded top end; a nice plus. For the price these are awesome. These were shipped with casters that have breaks. At this price point this is by far the Best Buy I have found. We have purchased 6+ racks from various different vendors and this is the best one so far. These are lightweight and easy to put together and we use them on a daily basis. My main complaint would be that it's a little hard to lock the wheels but other than that we've been happy. The only reason we give this product two stars is due to the pricing and the assembly was easy. However, we bought 12 racks in Nov of 2014, prior to even having them a year all the racks had shelving rails falling off bottom of the rack. All the racks we purchased are now missing nearly all the bottom 10 shelves. We have racks we can only fit 10 pans on due to this. We do not understand why it's happening to only the bottom of the racks, we use the same products and pans for the whole rack. It seems like the welds on the bottom half the rack were done improperly. We bought 12 racks but only have the user capacity of about 6 after only a year, it was actually less than a year when the shelving started falling off. Not impressed. Thank you for your review, Christine! We do apologize for this inconvenience! We would like to compensate you by sending you replacement racks for faulty ones you received. This is my second Regency 20 Pan End Load Bun / Sheet Pan Rack - Unassembled and I just wanted to say its a great price, its really easy to assemble by the way and a must when transporting in any bakeshop. Great buy!!! Holds a ton of products. We use this one in our walk in for extra storage. Holds a lot of items for us and is easy to move around. I give this product a 5 star because of how great the staff is from this website. We ordered one of these racks and it arrived damaged. All i had to do was send them a picture of the dings and dents and they sent me a brand new one immediately. This company is very prompt and very professional! We are using this sheet pan rack to store small parts during production in our factory. This review is based on assembly and initial quality, not long term use. Pros: - Easy to assemble - Well made - Caster wheels are good quality. Cons: - The edges of the aluminum angles where the trays slide on are sharp and scrape the trays. We are using plastic trays, and this was scratching the bottoms of the trays. We had to file and sand to make the edges smooth. - One caster wheel bolt would jam when trying to tighten the cross brace, because the holes didn't line up well. We had to file the post where the caster wheel attached to get a better fit. I will be buying more of these for our use of storing parts. They work perfectly, and are inexpensive. This sheet pan rack is very useful and spacious to store all types of food. It was easy to assemble and didn't take much time. Easy to put together and sturdy. We added this rack at the end of our line for our house made pasta and it saves a ton of counter space. Looks nice if you get past it being bent! I had to reshape it just to get it to halfway come together.. not happy.. it looks nice bUT will most likely be bent in shipping! Thank you for your review, Kenna. We are very sorry this sheet pan rack bent in shipping. A Customer Solutions Representative was happy to reship this rack for you. Thank you for your review, Bolanie. We are sorry your order was missing parts for this pan rack. Our Customer Solutions Representatives are always available to help should you have issues. Please contact them as soon as an issue arises. We use these racks for drying our food. It's not that durable, but for the value it is the best you can find. I wish there were steel grates that fit exactly in the racks, but it seems only pans are designed to fit. For the price this is a great product. The wheels are not super sturdy but for what it cost it is good to go!I just try to limit moving it. Bought 2 of these and it's very easy to assemble. It gets the job done and is very sturdy. A must in any commercial kitchen. These racks are perfect for curing soap. We get compliments on our rack all the time! Nice Rack, Webstraurant Store!! The casters roll over so many obstacles! This rack is great! We use it everyday and it works every time. It is very sturdy and holds a ton of pans. Easy to clean and has wheels that makes it easy to move. This rack is very light in weight, and still vary sturdy sturdy. I have had this rack for about 2 years now and it still in good standing. Great value for the money with this product, and love it so much, we bought two. In the market for a couple more and will buy again when on sale. These are a great rack and were a great price. It would have been nice to come with directions but it was super easy to figure out and only took about 10 minutes to put together. Great for big jobs. When we dirt opened our small bakery we needed to utilize space this definitely helped. It worked out so well that we purchased another a few months back. If business keeps up I'm sure we'll need another soon! This sheet pan rack is nice. It is well construction. It is not much different with other racks that we get from other places but the price is right when We also buying other things with combine shipping. This products is fine. Nothing special, but the price is right. It's a bit flimsy and wobbles around a bit. But for the price, it's fine. I must say, I was pleasantly surprised when we purchased this bun rack. I was looking for something that was economically friendly while still providing a long lasting sturdiness. This rack offered both. I own a bakery and a deli so we have a pretty big need for bun racks. I needed to find one that would be able to withstand the rigorous demand....this one delivered well! We will be buying more of these as we need to replace our old ones. This rack was great for about 5 months. Now all four of the ones we ordered are falling apart. Rails are coming unwelded, and bars are breaking. This is clearly not built for long term use and we'll have to replace them before a year has passed. Thank you for your review! We are sorry this rack did not last for you. A Customer Solutions Representative will contact you to assess the situation. Very easy to put together and it moves easily. I love that it's lightweight so I can move it myself even fully loaded. Very well made. Life savers! Our walk in is slammed full of kegs and back up, along with prep galore. These enabled us to create mobile storage that can easily be moved in and out of the walk in.. Love them! Sturdy and economically friendly speed rack! We have two and pull these things all over the place. Bolts need to be tightened occasionally, but it will hold a lot of weight. In the summer, we fill these things with cakes and cookies and everything in between. Easy to assemble and wheels roll great. Smooth rolling and able to hold all of the pans I need daily. It's the perfect amount of space between sections for my bread to rise. I really like the locking wheels when I am loading the rack. Highly recommended for any bakery or kitchen. Assembly was simple enough. I put this rack together close to three years ago? Keep it clean and it works fine. I have even had up to a couple of boxes of potatoes on it (on sheet trays). But i would not suggest weighing it down ridiculously since its not the other rack of solid construction and weld. But I haven't needed one of that durability. excellent buy for the money. Very sturdy and will come in handy for large catering prep. I've looked at others and you can't beat the quality for the price. Lowest price you can find. (similar racks would cost much more in the stores or other online vendors). The quality was good. We bought two. We've been using this rack for awhile now, it's perfect! We have rows of them lined up for drying salt. Easy to assemble and easy to move around. Coupled with a good price, would highly recommend! These rolling racks are easy to assemble and roll around the bakery. They have many uses, including holding our baked goods, hot meats, and even as a dish rack! Was quick and easy to assemble and is very durable. Gets some heavy action in our place. Wheels are very nice for easy moving around. Cart was working well the first few months, now all the screws keep falling out, bars have fallen off, and all the racks are breaking off. We are barely able to use the rack at all at this point. Thank you for your Review, Emily! We are sorry to hear that this bun pan rack has not lasted as long as it should have. A Customer Solutions Representative will contact you shortly to bring this issue to a close. Other reviewers said that these wheels move easily...mine don't but i'm afraid that may be user error. I really love the value of this item. You cannot beat the ease of having this rack to cool things as well as store lots of sheet trays. Love this rack. It rolls like a dream! The material is sturdy and thick. The wheels roll in all directions. Great for full size sheet pans or half size sheet pans. This is a great buy. I give it an A+ and would purchase again. Easy to set up and easy to clean. Perfect size for our chocolates, candies, & cookies! Have had it for nearly 2 years without problems and about to order another! Great bun pan rack! This is a must have for any restaurant or bakery with the need to cool down multiple pans at a time. Easy to assemble and ready to go right away! Regency brand does it great as usual. The bun pan rack you need at a price you can afford. I don't think you can find one any cheaper out there and the quality is better than some of the more expensive ones. This is such a great value. AMOK uses Regency products whenever possible because they consistently deliver on price and quality. This Bun Pan Rack is great for proofing breads and staging food for prep. I love this bun rack, its easy to assemble. I used it as a curing rack for my soap. Very sturdy and easy to move around. This bun rack is amazing. I also purchased the suggested trays and they fit perfectly. Assembly was very easy and it maneuvers well also. I am definitely purchasing a second one. Easy to assemble, exactly as pictured and described on the website. Took me about 15 minutes to put together and have working. Easy to wipe down at end of day, I plan to use this for quite some time. This is a lightweight, but sturdy piece of equipment. We use it for offsite. It is easy to take apart & put back together & easy to move. You can transport A LOT of product. If you need an inexpensive, basic bun pan rack, this should suit your needs. It isn't very heavy, the wheels work well, and it holds plenty of sheet pans. Thank you for reviewing this item! We are sorry to hear that you were not satisfied with your purchase of the bun pan rack. We suggest trying this Regency End Load Bun Pan Rack for a sturdy, stainless steel rack that will stand up to heavy use. We bought this rack because we needed the plastic cover to go over it and the specs of the cover deemed this was the best rack for the cover. It fits perfectly and we are happy with how well built this is. A fantastic value for the price. Easy to put together, and capable of holding enough full sheet pans to feed an Army. The casters are also quality, which is something you can't take for granted. Great quality product for the price. I use to store Advance Tabco 18-A-26 Heavy Duty Full Size 16 Gauge Aluminum Sheet Pan - Wire in Rim, 18" x 26". We purchased this rack to hold our chocolate covered popcorn while cooling. It was very easy to assemble. We just followed the instruction video from the website. The wheels roll very smooth and do not leave any scuff marks on the floor. We have had this product for 3 months now and are very pleased with the quality of the product. This pan rack is very helpful! I love it and hope to be purchasing another one soon. I like that I can space my soaps on the rack at different levels for the differing size. It is very durable! I use the rack for my crepes love it, I can move this rack anywhere I want in my kitchen. I have a good items for a good price. Very happy with the rack so far. It was a breeze to set up.. Only problem was it didn't come with instructions of how to put together, but there is a video with the product description. I ordered the Bun rack and took my brothers advise (he's a pastry chef) and Wow I can't believe I have been living without it for this long! I kept telling myself that I need another table in my shop but not no more! I put everything on the rack, from cookies, cakes, fondant and any other pastry item I am working on, it is a true life saver and a must in any cake shop!! Great buy- quality piece of equipment. Well worth the purchase. Would highly recommend this piece of equipment to other business owners. Well worth the price. Pan rack was easy to assemble. Looks great and is durable. Great asset to storing and cooling pies, Casters don't move well when empty but the rack is light so its no big deal. We were initially happy with these racks, but after 6 months they are now falling apart. They bolt together and will not stay together without Locktite adhesive on the threads. The cross bars have all broken off inside due to the flimsy construction. This required us to replace all of the bolts with longer replacements to get the back together. Many of the racks have lost quite a few of the tray guides. If you purchase this keep in mind that this is a VERY LIGHT DUTY rack. Thank you for your review! We're sorry to hear your racks are falling apart. For a rack made for heavier duty use, try this Advance Tabco Bun Pan Rack – 20 Pan Capacity which features joints that are welded together to ensure its strength. Great rack for the price. But be careful to inspect when they arrive. We had one arrive in perfect condition but the second had a gauge in the box and one shelf is broken, but we still use it. Easy to put together. Great space saver for a good price. Our pantry baking area is small and this rack gave us a great place to put all of our baked items such as breads, rolls, croissants, quiche and pies! I absolutely love this cart! Have used it for so many things in our school. Its like having an extra set of hands! Would highly recommend! Thank you for your review! We're sorry to hear your racks are having problems moving. Replacement casters have been sent at no charge to you! Have bought several of these over the last few years. Very happy with them, and the price is right. Can assemble in minutes with minimal fuss. Packaging is fair to good. We bought this rack to save some room on our counters. its well made. The height was too much so my husband cut it in half and put some wheels on the top piece. I now have 2 half racks that are amazing and versatile. I've ordered this piece twice, and I'm about to make a third purchase. It has been a great product for my business. Also, checkout is always smooth and easy. I am so glad I decided to purchase this product! I looked at it several times and kept second guessing myself. Once I got it, I realized how valuable it is to me as a great space saving storage for my cakes and made decorations! Don't know how I manages without it for so long! This was my first rack purchase for my new cookie company. It was easy to put together and it is light and easy to maneuver It is slightly fragile (scratches and can dent easily) But for the most part, I was pleased. I love my rack. It is amazing how much space it has on it. I have moved several times since I bought it and it still is as sturdy as the day I bought it! I am a handy person, but it wasn't necessary to put together this rack. It really did take only 5-10 minutes, watch the video and you are all set! It is very sturdy and I'm quite pleased with this purchase. I wish there had been a little cheap wrench included - I ended up using a 9/16" and 10mm wrench that I had lying around. These were inexpensive racks but they're worked just fine in our bakery. They get continuous use everyday without any issues. We don't push them around very much so i can't speak to the performance of the casters. What kitchen doesn't need a speed rack? This one was so easy to assemble for the price. It was well worth getting it unassembled and cheaper than paying for shipping of an assembled unit. Great rack for little money...can't wait to see it full of goodies! My countertops thank you for saving them and so does my bank account! I have 2 of these bun racks. One is purley for storage, I use bus tubs in it and store lids and all kinds of goodies in it. The other one is my staging rack. In fact right now it is loaded with canning jars and supplies as I am getting ready for a strawberry jam marathon. I never know what's gonna be going on with this rack because it changes as my needs do. My daughter wants one for all her jewelry any accessories. Sorry honey, I think she got the idea because at one time I even used my secondary rack to lay out cut fabric for a quilt I was working on. I love them, would buy another if I only had the room! They are fairly easy to assemble, take a lot of wear and tear and for me they are like moveable cabinets. Thanks for making them available to me. Love my new bun rack. It's sturdy and worth every penny. Great price for small business just starting out. Assembly was a breeze and super easy directions to follow. I LOVE my speed rack! Best purchase I have ever made. Very easy to assemble and you just can't beat the price. I use mine as a drying rack for my decorated cookies. LOVE IT!! I do a lot of baking out of my home and I purchased this to dry cookies on before packaging. It works beautifully. I didn't think I would ever use one so tall, but I have found other uses for some of the area. Works great for storing baking supplies. We absolutely love these bun pan racks, easy to assemble and tough as nails. We load bagels day in and day out, rolling the carts constantly. They hole up to the heat, the constant everyday abuse, we have even tossed them in and out of vans for markets and still not a hint of concern. Had them in a windstorm and locked the casters and they held strong. We bought 4 and are going to buy 2 more. LOVE this bun rack - we have it in our food truck (left off the casters) and it has given us much needed storage space. Very easy to assemble with a minimum of tools, and better quality than I expected for the price. It is sturdy - I store cases of water on sheet pans on the bottom racks and see no signs of warping, etc. Great value, and will be purchasing additional in the near future. This is a great rack. It seemed like it it would be difficult seeing all of the pieces and the fact that it didn't come with any instructions, but it was relatively easy to put together. We love this pan rack. Had it for about two years now and we're expanding and ordering a second one. Had to tighten it once or twice because it became loose but it stood up to heavy duty. You can't beat it for the price. PERFECT for anyone on a budget. Way cheaper than name-brand racks. We use one in the kitchen for our breads and other baking items and one in the walk-in cooler to hold dough. Was a bit tough to put together because the holes are just a bit too small for the poles to slide in easily, but overall once the first rack was built the second took no longer than 15 minutes. Easily move-able with the included casters. This was very easy to assemble. I did get a bit confused and put the wrong bars at the top and didn't notice it until I got to the bottom but overall, you can't beat this rack for the price. I will be ordering more of these once my business grows. Setup wasn't difficult but I'd recommend a wrench or socket set for the bolts and a rubber mallet to position the wheels. There were no instructions but the video at webstraurant.com was sufficient. It is very sturdy and seems to be very well made. A perfect utilitarian pan rack for my bakery. We use it throughout the day, every day. Great price for an item that will last a long time. This bun rack seemed like it was going to be difficult to build but it was not. We ordered 3 of these for our bakery and saved a lot of money even compared to buying used. If you are contemplating on buying this because you think the quality is not that good or not sure if it's worth buying like I did for over a year. Just stop what you are doing and get it. Quality is great, and I am kicking myself for awaiting as long as I did because this single handedly has made my baking so much easier. It is in my kitchen at home. It is not an eye sore it's a conversation piece and other woman want it. This was the least expensive and best quality for the price of all bun racks I looked at! It came fast and was easy to assemble! This pan rack is a must have in the kitchen. We use it for everything from prepping and storing refrigerated items on sheet pans, individually quick freezing products on sheet pans, and storing sheet pans of foods that have just come out or are going into the oven. Assembly was straight forward, and the quality of the rack for the price is great. Definitely a recommended product. I purchased my cart for my bath and body business and it works perfectly! It was super easy to assemble and holds a ton of product. I was skeptical of this rack because of the low price and needing to assemble it, but once it's together it is FANTASTIC. Excellent product for the money. My only issue is that the packaging leaves a bit to be desired. The box was a bit beat up (which isn't webstaurantstore's fault), but the worst part was that several of the bolts were missing because of it. I would have expected the mfr to bag the hardware and then tape it to the big frame of the rack, but nope, it was just rolling around in the box. I ended up going to Ace to pick up 3 missing bolts which is the only reason I didn't give this a 5 star rating. This is a sturdy, well priced bun rack. It arrives unassembled and is easy to assemble. Great value for the cost! I highly recommend it. we are adding 2 0thers in the near future. This rack suits our needs perfectly, and we are about to get a second one! It was easy to put together, and it is solid, very sturdy! The End Load Bun Pan Rack is exactly as described. Assembly is super easy and takes only 10 minutes. The supplies to put it together come with the rack, so no tools required. The Regency bun pan rack is the same quality as other manufacturer bun pan racks. It holds 20 standard full size sheet pans and is very simple to assemble. I have purchased several of these racks. They are easy to assemble. I have not had any issues with durability although we use them stationary in the walk in and freezer for storage. This bakers rack rolls easily into our commercial refrigerator. It is made of good quality metal and all of the large pans we bought fit perfectly! This is great for storing anything, but we use it to store cold process soaps while they cure. The wheels are heavy duty, and we don't know what we'd do without it. We also got the aluminum trays that go with it, and they slide in and out with ease and fit perfectly. Love it! A great item that assembles in virtually no time at all. We have many of these throughout our whole operation they are an essential part of our kitchen. Great Deal! We search around for a good deal on a tray rack when we opened our business and bought this one because of the great price. The quality will surpass your expectations! I use this rack every day in my bakery. It is extremely easy to assemble, and definitely the best price for a rack that I've found. My cookie sheets fit perfectly in this! This pan rack was a life saver for my growing home based business. I was thrilled to find a pan rack that held 1/2 sheet pans! Light weight, easy to assemble and durable. Easy to put together and amazing quality! The wheels were a little difficult to fit into the bottom, but price is right and solid quality. we have multiple bun racks, but this one is great for the money. It's holding up well, it has nice large casters that are heavy duty and always work well. I bought this rack (along with some cookie sheets) because I am going to bake a lot of cookies for an upcoming event and don't have the counter space for everything. I put this together easily myself and it has been great. I will definitely buy more of these when I open my own bakery! Sturdy bun rack that holds a lot of sheet trays. Both full size and half size work great. We use this in our walk-in as a speed rack and has held up very well. Very nice. Easy to put together. Great price for these as well. Literally a child around the age of 5 helped me to put it together, so it's super easy to assemble. The only tool needed is a wrench, unless your hands are super strong to tighten the bolts. These might not be heavy duty but they will still stand up to a lot of use! Cheaper in price but great for storing produce in a walk in fridge!! Great for our bakery. Has plenty of slots to place trays in. Has wheels but we just keep it in one place. Nice and sturdy design. We use this heavily all day. I was worried about the quality due to the low price but it has held up for a long time. This bun pan rack was easy to put together. Really like the different shelf heights so we can space the pans one or two slots apart. Very happy with our purchase. Very good unit. Works as expected. Very easy to put together. Caster wheels were of very good quality. Nothing negative to note about this item. Very good price for this product. Nice product for the price. Fits both standard and commercial pans. I was unable to find a used one for a comparable price, so this is a great deal. Great sheet pan rack. We have two of them. Very sturdy and helps greatly to organize your kitchen. Well worth double the price. Great for storage use as well. This bun rack is as useful and of the same quality as racks four times its price. I was very impressed with the quality and it is very sturdy. Pans slide in and out easier then some of my other racks and you can't beat the price. This knock down bun rack exceeded my expectations. It is sturdy as most welded units. I especially like the end load over side load as it takes up less space on my line. I love this rack - exactly what I was looking for - great construction and easy to put together a great bargin! I would definitely recommend. We love this bun pan rack, it works wonderful for our uses at church. It seems very light initially, but it is very sturdy construction and is used regularly. It has been designed well. This totally changed my inhume catering experience! It was like gaining 30 extra feet of counter space. My first event using this went so smoothly and I was able to kick up my feet for an hour before the guests arrived. Set up was a breeze too. Great End Bun Pan Rack, very easy to assemble, sturdy. This Great for our kitchen. I recommend this rack and will be purchasing another soon. THIS END LOAD PAN RACK IS REALLY GREAT, I USED THIS IN ALL MY CATERING EVENTS, NORMALLY I USED TO PLATE MY SALADS AND ALSO FOR STARAGE. This is what my bakery had been needing for a while for cooling baked goods. My only complaint about these racks is why aren't any cooling racks made to fit these? I was worried about the quality because of the price but this rack is a great value for the money! It was very easy to assemble--only took about 30 minutes. I am definitely going to buy another one! This rack is priced right. It is stuable for all but the heaviest loads your establishment can manage. It is easy to clean and was easy to assemble too! This bun pan rack is an excellent value for a very reasonable price. Sturdy, easy to put together (a crescent wrench is helpful), and easy to clean. this bun rack holds up in catering, which is a great endorsement. It has been loaded and unloaded from trucks many times--loaded. It has not shown any signs of weakening! Excellent rack, it has really helped in space saving in the kitchen and provides plenty of space to keep pans of cooling items. I would tell anyone with a kitchen to purchase one of these racks. I love the Bun Pan Rack. It was very easy to assemble and very sturdy. I am impressed, great price for such a magnificent product. I will be ordering more in the future. This bun pan rack has heavy duty welds and is very sturdy. I was able to assemble it myself in less than ten minutes. The pans slide in and out well. The wheels are smooth rolling but heavy enough so it doesn't slip away from you while loading it. Love it! This product holds a lot of cookie sheets, is easy to move, and is quite sturdy. The only complaint is that it sometimes leaves black smudges on employees' arms/hands. We think it has something to do with the cookie sheets scraping on/off the rack. This rack was easy to put together and fits our pans perfect. Great Quality and great price. The full size sheet pans slide in and fit perfectly. An excellent value product! The price is excellent, and the rack is surprisingly sturdy. It arrived flat and took about 30 minutes to assemble, by one person. The rack is of equal or better quality than a used one I purchased at a higher price.